was founded in 1987 in Clearwater, FL by Phil Ross. For 25 years Sun Microstamping Technologies has specialized in precision metal stamping, custom plastic injection molding, and custom insert molding for products featuring a high degree of difficulty. As a company experiencing growth, Sun Microstamping Technologies has two manufacturing facilities in Clearwater, FL and Matamoras, Mexico. For more information on Sun Microstamping Technologies you can visit their website here. Sun Microstamping Technologies being a company that fabricates precision parts, relies on the accuracy of their machines to produce these parts. Overtime these machines can wear down which risks the accuracy of the parts being produced. Sun Microstamping Technologies then contacted us here at NLS to conduct an inspection report on one of their produced parts to see how accurate the current model being produced at that time, is compared to the original design of the part. To begin the inspection process we took a series of scans of the part being produced to compile a scan that encompasses all 360 degrees of the product. With this scan we were then able to overlay it onto the original CAD model and see where there were any inconsistencies. With this information we were able to provide our customer with a detailed report of where we saw inconsistencies between the actual product and the original product design. Sun Microstamping Technologies needed quality assurance on a part they produce and we here at NLS were able to provide a detailed analysis. 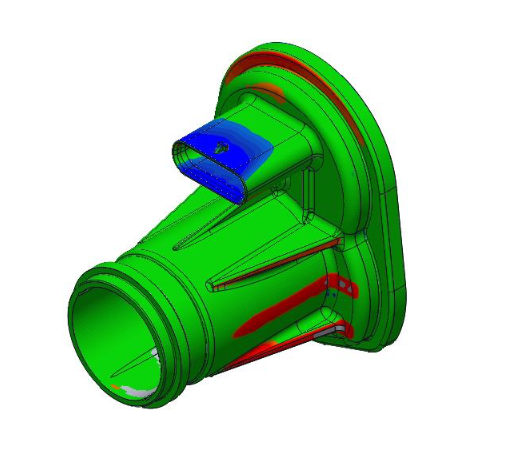 This analysis included identifying critical dimensions of the product and give specified tolerances on those dimensions. Not only did we provided our customer with a detailed analysis but by using our 3D scanning technology we were able to save our customer time, effort, and money.